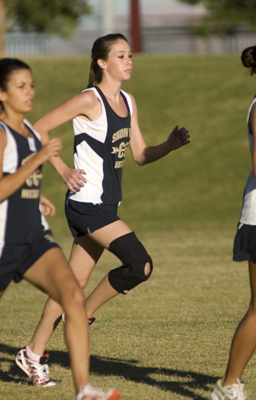 MARTIN S. FUENTES/REVIEW-JOURNAL Michelle Schenck, a Shadow Ridge high school cross country runner, runs a practice jog before a meet at Faith Lutheran high school in Las Vegas on Tuesday October 14, 2008. Shadow Ridge cross country coach Patrick Fitzgerald knew little about Michelle Schenck when she moved from Clovis, N.M., to Las Vegas last fall. And because of “miscommunication when she enrolled,” Fitzgerald said, Schenck missed the deadline to sign up for cross country as a sophomore. It wasn’t until the following spring, when Schenck caught Fitzgerald’s eye running track, that he realized what the cross country program had missed out on. “The first time I saw her run, a (1,600-meter) relay, we got the baton in fifth and she handed off in first,” Fitzgerald said. Now a junior, the 16-year-old Schenck quickly has become the Mustangs’ top runner and has a shot at winning the Sunset Region championship. She won the 3.1-mile Lake Mead Invitational in 20 minutes, 48 seconds on Oct. 4 and was first in the juniors division at the 2.8-mile Las Vegas Labor Day Classic in 19:23 on Aug. 30. Schenck also took second at the 3.1-mile Laughlin Invitational (21:08) on Sept. 20 and finished fifth at the 3.1-mile Las Vegas Invitational (21:02) on Sept. 13. So well, in fact, it has led Fitzgerald to call the Mustangs “definitely the most talented girls team we’ve had” since he became coach in 2004. Schenck was held out of running at a three-team meet at Faith Lutheran on Tuesday after apparently suffering a minor hyperextended right knee at school, Fitzgerald said. The decision was a precautionary move made shortly before the event, and she should be OK wearing a brace down the stretch, Fitzgerald said. Along with veterans Ashley Graf, Caity Richards and Palolo Prince, Schenck gives Shadow Ridge hope to challenge Sunset rivals Centennial, Arbor View and Palo Verde for a trip to the state meet Nov. 8. Schenck considers herself a “chaser,” which is to say she prefers to save much of her speed for the end of a race. “I stay with the pack for maybe the first bit of the race, but then I like to chase and head up toward the front,” she said. “I just like it a lot better. Fitzgerald doesn’t mind that approach because he respects Schenck’s ability to “feel out” runners. Schenck hopes to continue improving her speed over short distances during the track season, when she competes in the 800- and 3,200-meter runs. For now, though, Schenck’s focus is solely on helping the Mustangs earn that elusive trip to state. Individually, she should vie with Arbor View’s Katie Carrell, Centennial’s Brittany Williams and Palo Verde’s Kelsi Koch for the Sunset title.